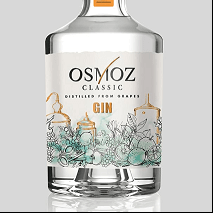 The nose of Osmoz classic is traditional ; the distinctive note of juniper is very expressive and full of delicateness. An herbal hint provided by coriander brings freshness. Balsamic and resinous aromatic notes remind of fir tree bud. In the mouth, the attack remains subtle. The well represented juniper evolves toward the freshness of coriander and cucumber. This gin has a light structure and fills the palate with fine aromas of fruits, citrus and spices.